where the wild things are. jerusalem artichokes. 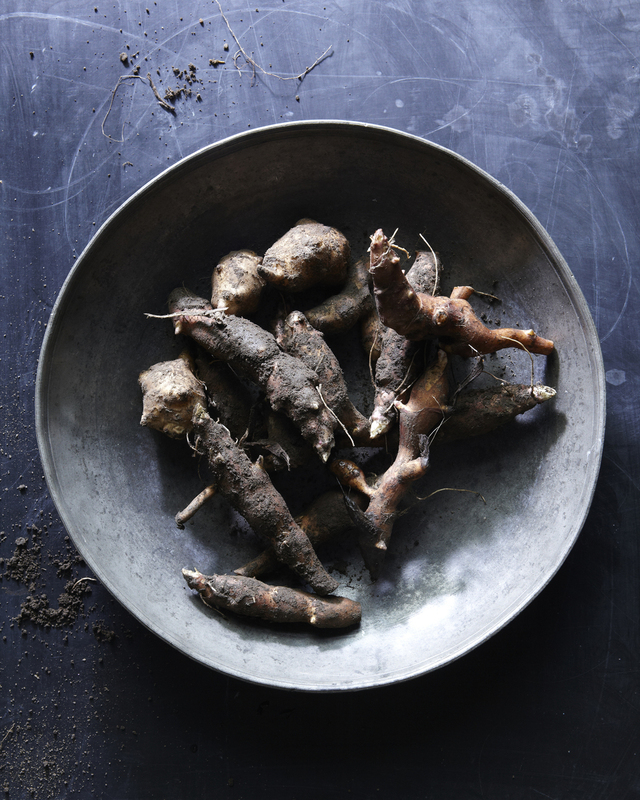 The Jerusalem artichoke, sometimes referred to as the Sunchoke or Sunroot, really has nothing to do with what we know of as an artichoke. It is a plant that was highly valued and cultivated by Native Americans. I have read that the Spanish and Italian settlers called it Girasol, their word for Sunflower, which was later bastardized to Jerusalem. 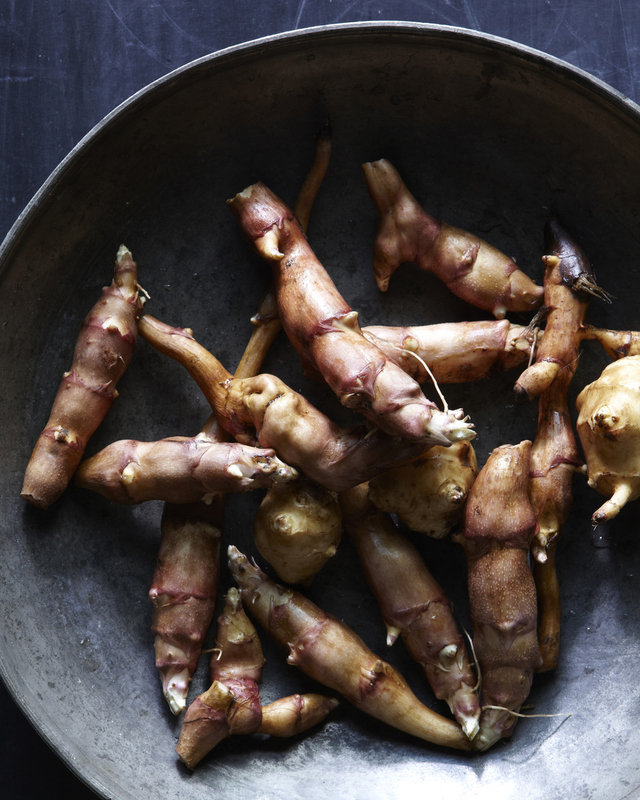 Over time, the cultivation of Jerusalem artichokes fell away and the tubers became little known save for a select few, until recently, as they have made a huge comeback with chefs and local farmers markets. Quite often what you see is a naturalized Jerusalem artichoke that has been gathered from the wild where they grow along the roadside. The Jerusalem artichoke is now also being being cultivated. I try to make a habit of buying the wild ones but you will easily find culitaved ones at your green market. Wild crafters can easily spot these imposter sunflowers in the summer, as they closely resemble a wild sunflower. The edible tubers, buried beneath the ground are knobby and elongated. The skin of the tuber is a brown or purple. Several tubers are clustered at the base of each stem. In summer, the plant gets quite tall with bristly woody stems and green pointed leaves. They bear yellow sunflower-like flowers. They remind, me in size, of a Black-Eyed Susan. They lack the large dark seeded center of a traditional sunflower but bear many other similarities. The time to spy your artichoke spot is when the flowers are in bloom. It will not be hard to miss these brilliant patches of wild yellow flowers. Remember it and commit it to memory! Return to your spot in the late fall to dig some artichokes after the first frost. Jerusalem artichokes keep best in the ground so they can be collected straight through to spring. 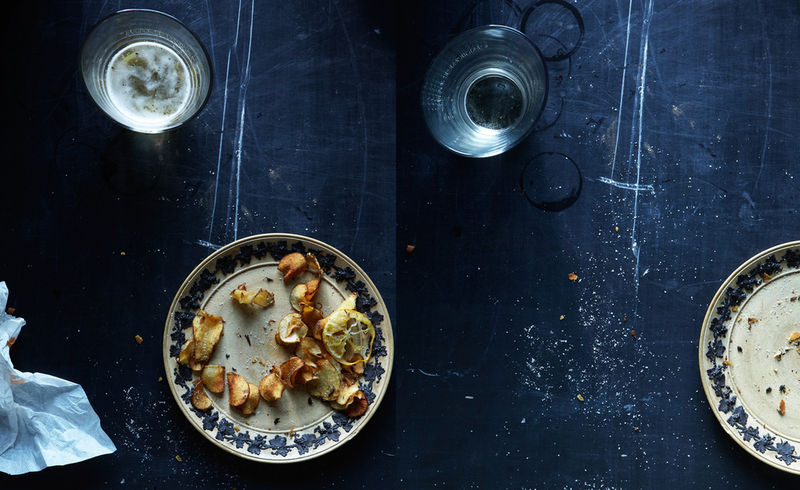 Last weekend, I made a great afternoon snack of fried Jerusalem artichokes along with a carpaccio of Jerusalem artichokes. The carpaccio was very light crisp and nutty! Add a little sea salt and eat immediately!! I used rosehip salt and a little wild mint but good old-fashioned sea salt will work just fine!